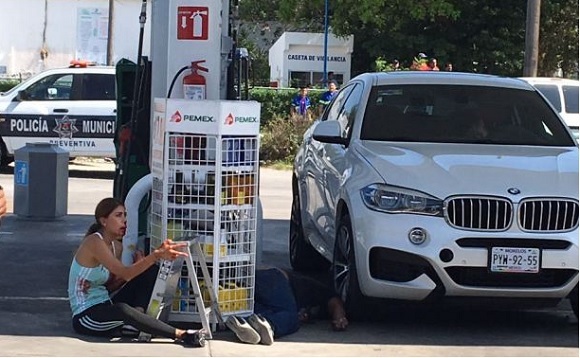 CANCUN, Q. Roo — Cancun’s murder wave continued to accumulate more victims Tuesday June 14, when two people were shot to death in broad daylight at a gas station near the entrance of the Hotel Zone on Avenida Bonampak. Two women, including one minor, were injured and were taken to a hospital. 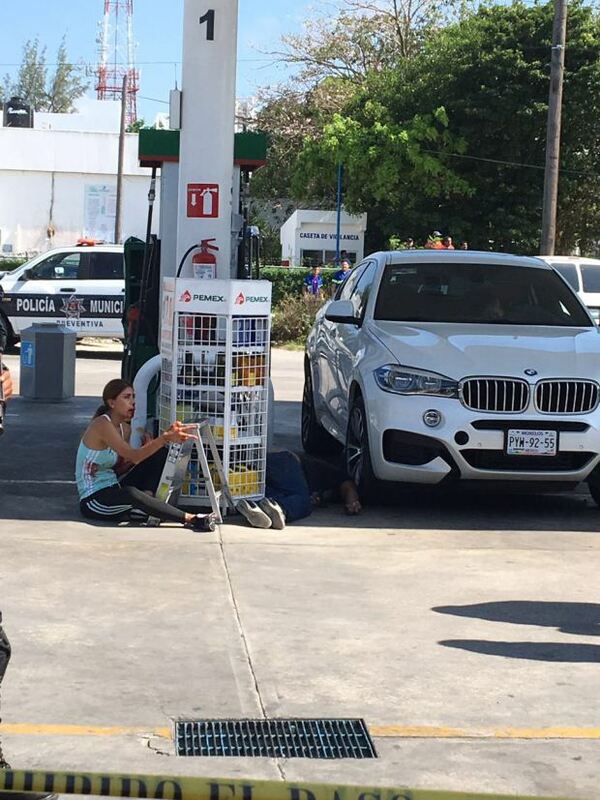 According to a preliminary report, the attack occurred around 3:30 p.m. when unidentified gunmen fired from a SEAT auto into a white BMW, with state of Morelos plates, which was being refueled at the gas station. The victims were identified as Amado C. and Javier S. M.
A woman, identified as Johana S., 26 years old, sustained injuries to her nose, chest and mouth, while a minor, identified with the initials M. R. S, 14, had a wound on her arm. The two women are from Cuernavaca, Morelos. At the wheel of the BMW was the body of one victim, Amado C., while the other murdered man, Javier S. M., was lying on the pavement, on the right side of the car. It was not immediately known if the injured women were also riding in the BMW. Around the BMW were found several 9 mm caliber shell casings. Unofficially, it was learned that the attackers were riding in a green SEAT car with Mexico State plates. According to witnesses, one of the gunmen wore a red shirt and jeans, while another wore a black shirt. After the incident, the whole area was cordoned off and road traffic was closed from the so-called zero kilometer to Avenida Uxmal. Police were searching for the suspects but no arrests had been reported by Wednesday morning. Acapulco is coming to Cancun. Um… not ANYWHERE near the hotel zone. Yes, sad that it happened but maybe get the information correct. KM 0 is the entrance to the HZ, there are hotels all around that area. The info that is of concern is how the criminals are acting with total impunity. There are not hotels around the area.. the nearest is in Plaza Las Americas which is quite a ways away and that is not considered the hotel zone. I know exactly where it is – less than a 1/2 block from my dentist. Saying it is in the hotel zone (where there are mainly tourists) is just not true. Saying it has become like Alcapulco is also not true. I go to Cancun 1-2x a week and will continue to do so. PLaza las Toros is 4 blocks away, Plaza las Americas is across the street from that. Do you mean the hotels around KM 0 are not where foreign tourist go? There are many hotels all along Bonampak and Av. Tulum. Just look back and you’ll see the drug dealers are gun battling with cops and the “reported” murder rate is rising. I’ve lived here since 2001 as well as Aca from ’93 to 2001 ….it’s happening. I personally know many business owners that either pay extortion or have had to close their shops because they couldn’t afford to pay. When they report to the authorities they are essentially told there is nada they can do and to pay it..
Hey, it breaks my heart but being in denial doesn’t help either. When Greg Sanchez is now considered a legitimate candidate for public office after what he did just shows the level in which dirty money has penetrated.